The A.V. Club loves the holiday season, and we also love opening small doors and eating the stale chocolate lurking behind them. We’ve found a way to combine those things with our love of pop culture, and we’re hoping you’ll join us through the holiday to open one of our virtual doors and find out which holiday-themed entertainment we’re covering that day. This week’s theme: holiday classics, old and new. When I was 18, my taste in comics ran toward edgy fare like Sandman, Watchmen, and Love And Rockets. Donald Duck was not high on my list of priorities. Sure, I loved the cartoon DuckTales as much as the next kid who grew up in the ’80s (not that you have to be of any certain generation to appreciate the show), but being 18 meant putting away such childish things. Thank God I never really did. I worked in a comic-book warehouse right out of high school, and my boss—a ’60s hippie who mostly read Robert Crumb—happened to be a massive Duck fan. In particular he worshipped the Duck comics of yore, those crafted by the master, Carl Barks. I knew all of this because my boss wouldn’t shut up about it. One day at the warehouse, he pushed some old Duck reprints at me and more or less told me that at least trying to appreciate Barks was a prerequisite for being a true comics fan. First published in 1947 (and just reissued in a beautiful anthology volume by Fantagraphics), “Christmas On Bear Mountain” isn’t just any Yuletide fable, nor is it just any Duck yarn. It’s the first appearance of Uncle Scrooge. I’d grown up on superhero comics, and I was a sucker for first appearances—and wisely, Barks doesn’t try to shoehorn in an origin story. Uncle Scrooge—greedy, grumpy, irascible, uncharitable, and downright misanthropic—appears on the scene fully formed, as Donald’s wealthy uncle who lures his empty-pocketed nephew (and Donald’s own three nephews) to his luxurious cabin for a seemingly generous holiday vacation. Instead, the coal-hearted Scrooge wants to scare Donald and his so-called freeloading brood by dressing up as a fearsome grizzly bear and turning their Christmas into a terror-fest. Barks didn’t choose Scrooge’s name by accident, nor was he afraid to milk it. Uncle Scrooge is a direct reflection of Charles Dickens’ Ebenezer Scrooge, the most threadbare archetype in the Christmas mythos. But like the hardened-miser-turned-saint of A Christmas Carol, Uncle Scrooge experiences a revelation and a transformation. After he sees Donald, Huey, Dewey, and Louie cavorting with real grizzly bears—a case of mistaken perception, one of Barks’ comedic stocks-in-trade—he realizes that his deadbeat nephew Donald is made of sterner stuff than he’d ever known. Thus begins one of the richest friendships in Disney history, as well as in comics history as a whole: between Donald, the grumbling but good-hearted everyduck, and Scrooge, the duck who has everything but always schemes for more. 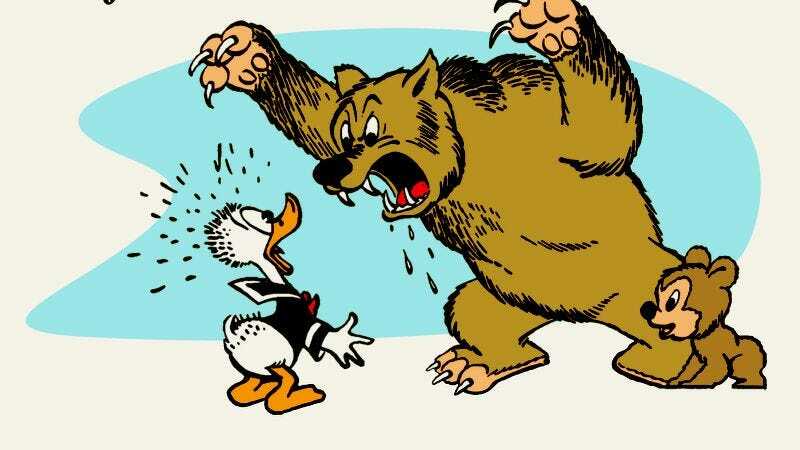 At the start of “Bear Mountain,” Scrooge bemoans the fact that Donald is eating the expensive contents of his cabin icebox by snarling, “I never gave a man a free meal in my life!” After his Christmas epiphany, he turns not into a saint, but a better-duck-in-progress. Likewise, Scrooge’s better attributes—cunning, self-possession, and determination—start to rub off on Donald. The establishment of this deceptively complex dynamic—one that runs all the way up to DuckTales—isn’t the only reason I still adore “Bear Mountain.” There’s also the way the story is so timeless. For one thing, it’s secular, and that universality makes it far more approachable. But it also avoids another kind of pervasive, Yuletide religiosity: the gospel of sappiness. There’s nothing sugary or silly about “Bear Mountain,” as lighthearted as it is. Rendered in Barks’ immaculate, fluid linework and seamlessly virtuosic draftsmanship, the story nonetheless has sharpness to it. Hunger, poverty, and even class-consciousness are injected invisibly into the tale, forming an underpinning that provides far more heft than, say, your typical Scooby-Doo, man-in-a-monster-suit caper. The alchemy between sentiment and cynicism is so carefully balanced, it doesn’t feel like a dichotomy at all—just a roundedness that I came to realize suffuses all of Barks’ work. Take into account the fact that this story was created in 1947, so soon after the rationing of World War II (and, before that, the mass privation of The Great Depression), and it adds even more poignancy to what is ostensibly a kids’ story. Grownups love Barks’ Duck classics as much, if not more, than children, and it’s easy to see why. This is soulful stuff, on par with contemporary works of comics genius like Hergé’s Tintin, René Goscinny’s and Albert Uderzo’s Asterix, and Will Eisner’s The Spirit. It may have been a far cry from Sandman and the other self-consciously transgressive comics I was reading when I was 18, but “Bear Mountain” was—in its own way, and in its own context—just as edgy. As it turns out, my late teen years were also the time when I started to rethink my antipathy toward Christmas. Sure, it was commercialized and Christian and all those things I loathed as a teenage punk. But as Scrooge and Donald found out, it could be about revelation; Christmas can be whatever you want to make it. It wasn’t even Christmastime when my boss at the comic-book warehouse thrust “Christmas On Bear Mountain” on me, but it remains one of the best presents I’ve ever been given. Tomorrow: Christmas is a time to kick back and relax with your family—even if that family is the Griswolds.